I still have my paperback copy of The Golden Turkey Awards (1980), the terrific little book by Harry and Michael Medved. The book awarded Plan 9 From Outer Space, an attempt at combining horror and science fiction, the glorious title of Grand Prize Winner for Worst Film Ever Made. This was based on a survey of movie fans, and was a remarkable achievement when one considers that audiences usually have a bias for their more contemporary experiences. Having recently had the pleasure of enjoying Plan 9 From Outer Space, it is indeed stupefyingly bad. It is difficult to imagine that this was not a joke -- that this was a serious attempt a movie-making. The plot, the sets, the script, the acting, the directing -- are all worse than what one expects from a high school play conceived by 16 year olds. It is also difficult to imagine that this film was pulled together in 1959. It comes across more like something out of the early, pre-1920's silent era of movie-making. But Plan 9 is, incredibly, a contemporary of films like Ben Hur, Some Like It Hot, and North by Northwest. So there it is, on film, wooden actors keeping a straight face while spouting the most inane lines of dialogue and avoiding plastic sets that look like they were assembled after a salvage trip to the local landfill. Director Edward D. Wood Jr. has achieved legendary status for this effort. I suppose if you are going to be a bad director, you may as well be really bad. The plot? Aliens who look exactly like humans have concocted a remarkable plan to kill-off humanity. They want to destroy the world in order to save the rest of the universe from the stupidity of earthlings. You see, war-loving humans are on a path to destroy the sun. The aliens are here to save this village by destroying it. The aliens will wake up the dead from the local cemetery, who will then stumble around with outstretched arms killing other humans. This is the ninth plan that these aliens, who may be low on budget but are obviously not short of good ideas, have come up with. We still eagerly await the films that reveal what the first eight plans were like. 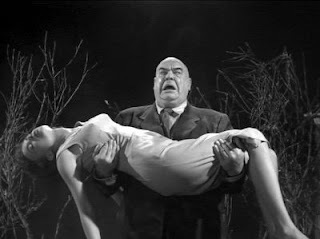 For rather unclear reasons, probably related to the resource limitations, the aliens are only able to resurrect about three dead folks, including a remarkably thin Vampira and the counterweight Tor Johnson. It is left up to a bland airline pilot who lives on the edge of the cemetery and an inept army General, who looks like a satire of every other movie army general but does not know it, to team up and stop the evil aliens in their tracks. The final battle apparently takes place inside the lead flying saucer, which looks like a typical office that was only half-furnished. It takes one small pistol, a few punches, and good old American bravado and the aliens, for all their technology and ability to raise the dead, are terminated. Most of the action takes place in and around the cemetery, with headstones that sway when actors run past them. Stock footage of intense army manoeuvres is trotted out at one point, apparently to demonstrate the army battling some other band of evil aliens. 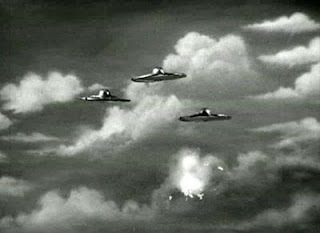 Plastic plates - presumably flying saucers - are shown rotating menacingly over earth. Somewhere in there, director Wood throws in unrelated scenes featuring the once famous Bela Legusi, who apparently shot some scenes with Woods for a whole other film and then died. Plan 9 From Outer Space, while funny and entertaining in ways that were never intended, is ultimately also a bit sad: there is genuine sympathy for the stunning all-round lack of talent and lack of resources that are mercilessly on permanent display.